WASHINGTON, Aug. 26, 2011/PRNewswire-USNewswire/ — This morning, thousands of Iranians from 41 states across the U.S. staged a huge and colorful rally outside the State Department urging the immediate delisting of the Mujahedin-e Khalq (PMOI/MEK), Iran’s main opposition movement. 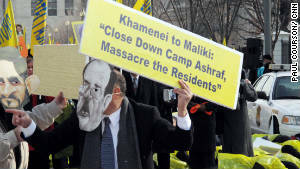 They also called for ensuring protection of MEK members in Camp Ashraf, Iraq, according to Human Rights and Democracy International. The ensuing march stretched several blocks around the State Department. The police were very cooperative by blocking the lanes for the peaceful marchers. Among the participants were more than 100 university professors, eminent scholars and physicians from all over the U.S.